Popcorn can either be good or bad for a person’s health, depending on what goes into making it. On its own, without any added sugar or salt, popcorn makes a nutritious, healthful snack. Popcorn is a type of corn kernel that, when people heat it, it pops to become light and fluffy. Popcorn contains plenty of nutrients and vitamins when people make it in the right way. In this article, we look at how popcorn can be a healthful snack, its nutritional values and benefits, and which types are the most healthful. We also look at how people can make their own healthful, air-popped popcorn at home. Popcorn contains vitamins and minerals and is high in fiber. Popcorn can be healthful when manufacturers or individuals prepare it the best way. Air-popped popcorn with no oil provides the best health benefits. People can air-pop popcorn by heating popcorn kernels in a popcorn maker or on a stovetop. Many people will be more used to eating popcorn at the cinema with toppings or flavorings. These added extras tend to have little nutritional value. Microwave popcorn may also contain additives, and the bags can have contaminants. Premade popcorn often contains a high level of salt, or sodium. Eating too much sodium can cause high blood pressure and lead to other health complications. Some brands also include a lot of sugar. These added ingredients mean that, while popcorn does have lots of health attributes, people should choose specific types and include it as part of a healthful diet. However, eating sweetened or salted popcorn as a treat, from time to time, will usually not do any harm. Below, we discuss the beneficial nutrition qualities that popcorn can provide. Popcorn is a whole grain, which refers to a group of seeds that come from crops that include barley, millet, oats, rice, and wheat. Unlike refined grains that manufacturers have processed to remove the bran and germ, whole grains include the entire grain seed, also called the kernel. This means that whole grains contain dietary fiber, protein, vitamins, minerals, and beneficial fats. Other examples of food made of whole grains include brown rice, wholemeal bread, and oatmeal. As a whole grain, popcorn is high in fiber, which is good for digestive health and promoting regular bowel movements. According to the United States Department of Agriculture (USDA), a typical 3-cup or 24-gram (g) serving of air-popped popcorn contains 3.5 g of fiber. The recommended daily intake for the average person in the U.S. is more than 25 g a day, and most people do not reach these levels. Learn more about daily fiber recommendations here. Popcorn also contains protein, with a typical serving containing just over 3 g of the 50 g daily value. The body needs protein for many processes, from blood clotting and fluid balance to immune response and vision. Every cell in the body contains protein, and it has an important role in building and repairing cells and body tissues. Unsalted, air-popped popcorn contains many vitamins and minerals, including calcium, potassium, vitamin A, and vitamin K.
Can people use popcorn for weight loss? A person can lose weight by adopting healthful eating habits. Air-popped, unflavored popcorn is low in calories, fat, and sugar, and high in fiber. This means that when someone eats it as part of a balanced diet, popcorn can help them lose weight. According to the Centers for Disease Control and Prevention (CDC), the best way for most people to lose weight is by making healthful lifestyle changes. These include healthful eating habits, regular physical activity, and balancing the number of calories consumed with those that the body burns. Fruits, vegetables, and whole grains, including popcorn, are an essential part of a healthful diet. Foods that are low in saturated fat, trans fats, cholesterol, and added sugars, again, including popcorn, are also good choices. The CDC recommend that people limit their salt intake, however. Popcorn can be high in salt, and so checking the nutrition labels on the packaging to find out how much salt or sodium each item has is sensible. Healthful eating should be about balancing, rather than restricting which foods people eat. This means that a reasonable portion of salted or sweetened popcorn as an occasional treat will not do any harm. 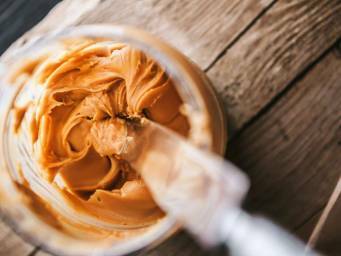 In this article, we look at the nutritional and health benefits of peanut butter. What are the most healthful types? Fat and sugar in caramel popcorn can vary significantly, depending on the brand. Microwave popcorns vary by type and brand too. People can check the product label for the nutritional information they need to make a healthful choice. Air-popping means heating the hard popcorn seeds, or kernels, in hot air until they burst and become popcorn. People can add oil or butter for flavoring, but the popcorn does not need any oil to pop. If someone wants to add oil, they can use a version that contains healthful polyunsaturated fats, such as avocado oil. People can buy unpopped popcorn kernels from supermarkets or online stores. If someone prefers not to use the stovetop method, they can choose between a range of popcorn makers online. Is popcorn healthful for people with diabetes? When they eat it in moderation, popcorn can be healthful for people with diabetes. Air-popped, unsweetened, unsalted popcorn contains around 78 percent carbohydrates. This means that it is healthful for people with diabetes only if they eat it in moderation. People with diabetes have trouble making enough or being sensitive enough to insulin, a hormone which controls the levels of sugar in the blood. Because carbohydrates break down into sugars once they are in the body, people with diabetes monitor how much carbohydrate they eat to avoid complications. Daily and per meal carbohydrate goals vary, according to many factors. It is best for those with diabetes to work with their healthcare team to determine the right amount for them. The American Dietetic Association define 1 serving as around 15 g of carbohydrate, which is equal to 3 cups of air-popped popcorn. Once a person knows their specific carbohydrate goal per meal and per day, this definition can help them work out whether popcorn can fit within a meal or their day. Depending on its preparation, popcorn can be a healthful snack. When air-popped, unsweetened, and unsalted popcorn contains plenty of fiber, vitamins, and minerals that the body needs. Checking the labels of foods before buying them and preparing ingredients at home can help people make more healthful dietary choices. A, Healthy, is, popcorn, snack?